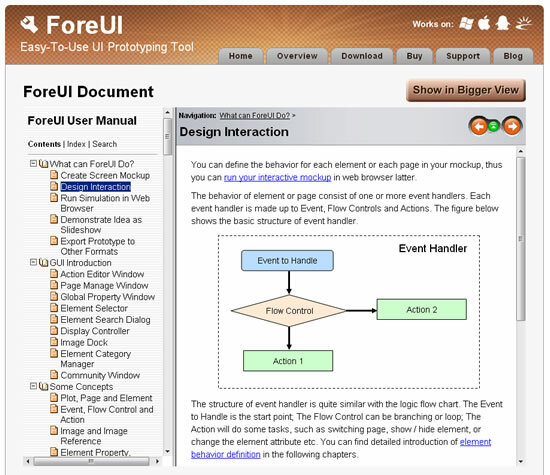 Hello everyone, recently we were working on the new documentation of ForeUI, and now it is online! The new documentation has much more content than then previous document. It includes about 200 pages and have all features introduced, and you will find the full reference for all elements, events, flow controls, actions and properties. You could also make good use of the keyword index and full text searching tool. We will keep improving the documentation. If you have any comment or suggestion on it, please feel free to contact us. Dear friends, we just released ForeUI V2.77 this morning. This version includes the support for two more languages, two enhancements on usability, and two bugs fixings. 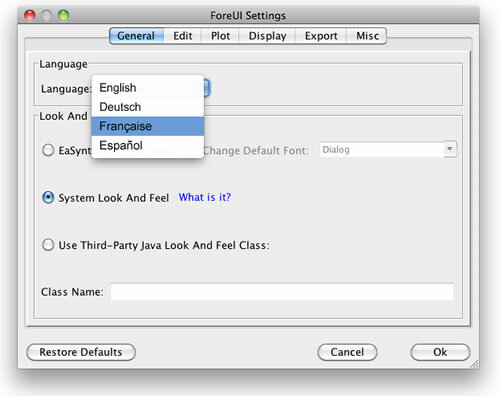 In the new version you can select French or Spanish language in the settings window. The French translation is made by Monaury Cecile, and the Spanish translation is made by Ernesto E. Bravo Cardoso. They are all volunteer contributors and we really appreciate their great work. Thank you Monaury Cecile! Thank you Ernesto E. Bravo Cardoso! Many Mac users are using one-key magic mouse, so they could not RIGHT drag element into container. We accept Eric’s suggestion and make this enhancement: you can press the Control key on keyboard to simulate a right drag. In previous versions, if you embed an element into an empty container, no matter at what position you embed it, the embedded element will be moved to the left-top cornor. Some may say this annoying behavior should be a bug. Anyway it is improved (or fixed) now: the newly embedded element will stay where it was. Bug_0300: Table’s initial selection offsets one row in simulation (since V2.72). Bug_0301: Image dock’s scrollable area does not match its content. Thank Mark’s report for this problem.